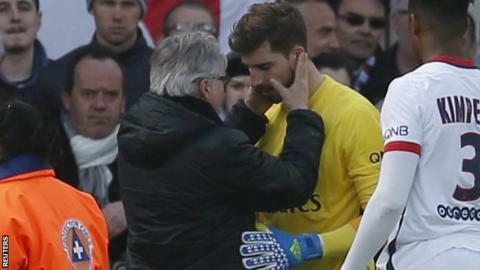 Paris St-Germain goalkeeper Kevin Trapp is a doubt for Tuesday's Champions League quarter-final trip to Manchester City after injuring a knee at Guingamp. Trapp was hurt in the 13th minute of the champions' 2-0 Ligue 1 win when he collided with team-mate Layvin Kurzawa. The German, 25, was replaced at half-time by Italy international Salvatore Sirigu. Lucas Moura scored twice for PSG, who drew their first leg against City 2-2 last Wednesday. Manager Laurent Blanc rested most of his key players, including top scorer Zlatan Ibrahimovic, in readiness for the trip to Manchester. PSG, who fielded their youngest starting line-up in more than 20 years, went ahead from the penalty spot early in the second half. Lucas sent goalkeeper Jonas Lossl the wrong way after Jeremy Sorbon had fouled Christopher Nkunku. The Brazilian winger secured victory when he controlled Kurzawa's cut-back before beating Lossl. PSG, who secured their fourth successive title on 13 March, are 28 points clear of the two teams closest to them, Lyon and Monaco. Match ends, Guingamp 0, Paris Saint Germain 2. Second Half ends, Guingamp 0, Paris Saint Germain 2. Substitution, Paris Saint Germain. Yakou Meite replaces Jean-Kevin Augustin. Hervin Ongenda (Paris Saint Germain) wins a free kick in the defensive half. Foul by Julien Cardy (Guingamp). Attempt saved. Jimmy Briand (Guingamp) header from the centre of the box is saved in the top right corner. Assisted by Ludovic Blas with a cross. Corner, Guingamp. Conceded by Presnel Kimpembe. Julien Cardy (Guingamp) wins a free kick in the defensive half. Substitution, Paris Saint Germain. Kevin Rimane replaces Marquinhos. Jean-Kevin Augustin (Paris Saint Germain) wins a free kick in the attacking half. Benjamin Stambouli (Paris Saint Germain) wins a free kick in the defensive half. Foul by Jimmy Briand (Guingamp). Foul by Lars Jacobsen (Guingamp). Substitution, Guingamp. Julien Cardy replaces Moustapha Diallo because of an injury. Delay in match Moustapha Diallo (Guingamp) because of an injury. Attempt missed. Jimmy Briand (Guingamp) right footed shot from the centre of the box misses to the right. Assisted by Younousse Sankhare. Offside, Guingamp. Ludovic Blas tries a through ball, but Marcus Coco is caught offside. Attempt saved. Lucas Moura (Paris Saint Germain) right footed shot from outside the box is saved in the centre of the goal. Assisted by Christopher Nkunku. Goal! Guingamp 0, Paris Saint Germain 2. Lucas Moura (Paris Saint Germain) right footed shot from the centre of the box to the bottom left corner. Assisted by Layvin Kurzawa. Corner, Guingamp. Conceded by Layvin Kurzawa. Hand ball by Lucas Moura (Paris Saint Germain). Corner, Guingamp. Conceded by Christopher Nkunku. Attempt missed. Mana Dembele (Guingamp) right footed shot from the right side of the box is high and wide to the right. Assisted by Marcus Coco. Substitution, Guingamp. Mana Dembele replaces Mevlüt Erdinc. Substitution, Guingamp. Ludovic Blas replaces Thibault Giresse. Attempt missed. Christophe Kerbrat (Guingamp) header from a difficult angle on the left is high and wide to the left. Assisted by Thibault Giresse with a cross following a corner. Corner, Guingamp. Conceded by Salvatore Sirigu. Offside, Paris Saint Germain. Blaise Matuidi tries a through ball, but Hervin Ongenda is caught offside.